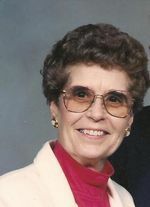 Irene Mae Lawrence, age 89, of Ashland, OH., passed away Thursday, February 26, 2009, at Brethren Care Village in Ashland. On November 17, 1919, in Hopewell Twp., Seneca Co., Ohio, Mrs. Lawrence was born to the late Ira and Mabel (Staley) Curry. She had been a resident of Ashland Co. since 1953. Mrs. Lawrence was a homemaker and formerly was a seamstress for Cresco Mfg. in Ashland and C.E. Ward in New London, OH. She enjoyed gardening and yard work in her spare time. Mrs. Lawrence was a member of Grace Brethren Church in Ashland. On January 27, 1940, Mrs. Lawrence married Lester Lawrence who preceded her in death in 1997. Mrs. Lawrence is survived by a son and daughter-in-law: Donald and Linda Lawrence of Ashland; 3 daughters and 2 sons-in-law: Nancy Cronebach of Ashland, Carolyn and Dean Glenn of Adario, OH., Bonnie and Fred Ropp of Nova, OH. ; 11 grandchildren; 21 great-grandchildren; 1 great-great-grandchild; and a sister and brother-in-law: Thelma and William Shuey of Tiffin, OH. Mrs. Lawrence was preceded in death also by 3 brothers: Harold, Elmer, and Marion Curry; 2 sisters: Geraldine Lawrence and Grace Lawrence; and 1 great-grandchild.